The Emory students were among more than 18,000 U.S. medical students who applied for residency positions at U.S. teaching hospitals through the National Residency Match Program (NRMP). Before, during and after Emory Match Day, photos and video were flying on social media. 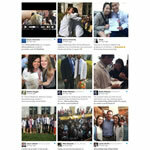 To see a compilation of Twitter, Facebook and Instagram, visit the #EmoryMatchDay Storify! Match Day is the annual, nationwide pairing of graduating medical students with postgraduate residency training programs. The Emory students were among more than 18,000 U.S. medical students who applied for residency positions at U.S. teaching hospitals through the National Residency Match Program (NRMP). "Today is an exciting rite of passage for our medical students, a much-anticipated culmination of years of hard work and dedication," says J. William Eley, MD, MPH, executive associate dean for medical education and student affairs, Emory University School of Medicine. "Our students matched in extraordinary residencies from the top programs both here at Emory and throughout the nation." Some of the most popular specialties chosen by Emory's graduating seniors in the NRMP match include: Internal Medicine, General Surgery, Radiology, Pediatrics, Emergency Medicine and Obstetrics/Gynecology. The students will receive their residency training at prestigious institutions throughout the U.S. such as Yale, Brown, Johns Hopkins, Harvard, Cornell, Duke, University of Pennsylvania, Vanderbilt, Columbia, NYU, University of Chicago, UCSF, UCLA, Mayo Clinic, and Washington University, among many others. Thirty-eight graduating students will spend all or part of their residencies in the State of Georgia, 36 students will begin their internship year in Georgia, 35 students will begin their internship year at Emory and 28 will remain at Emory for their entire residency training. Prior to today’s NRMP match, four Emory graduating seniors had matched into the military residency match, two students had gained matches in Urology, and five students had matched in Ophthalmology. The Match was established in 1952, at the request of medical students, to provide a fair and impartial transition to the graduate medical education experience. A complex algorithm, administered by the NRMP, factors in the preferences of the students with the preferences of residency programs in order to fill the available training positions at U.S. teaching hospitals.